In the fight for racial justice on campus, 2016 stands in the shadow of 2015. Last November, black students took American higher education by storm—raining demands for dignity and justice, winning, and uniting #BlackLivesMatter with the integration-era struggles of #ConcernedStudent1950. As Donald Trump’s election brings urgent new threats, students are getting organized. In this post, students from two groups, SOUL at Penn and the high school–focused Youth Blackout DC, report on what’s next. 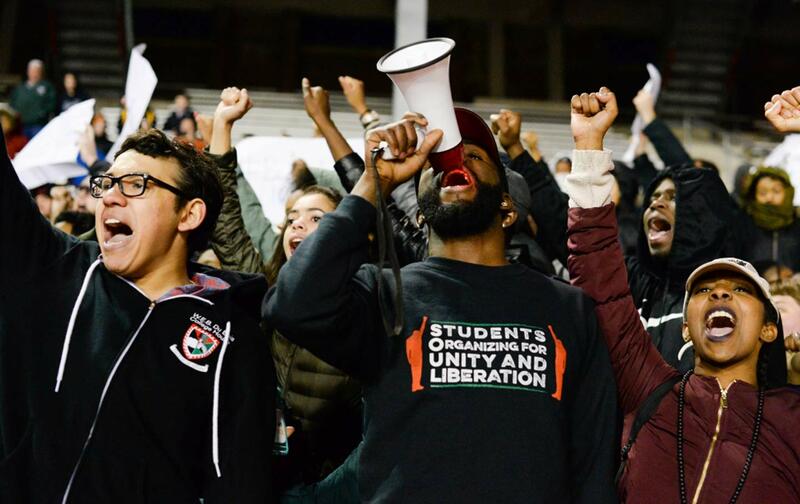 This post is the latest edition of The Nation’s student- and youth-organizing feature, edited by James Cersonsky (@cersonsky). When Will Trump’s Alma Mater Answer for Its Racism? On November 11, several black freshmen at the University of Pennsylvania were added to a racist GroupMe chat, operated by students in Oklahoma, one of whom had been accepted by Penn, threatening them with lynching. As soon as we learned about this, SOUL, alongside the Black Graduate Student and Professional Assembly, began organizing to protest the environment that allowed it to happen—and hold our administration accountable. At 7 pm, 300 black students and allies assembled in front of Huntsman Hall, where President Amy Gutmann was giving a talk inside. From there, we marched toward Franklin Field during the Penn-Harvard football game. As we tried to enter the stadium—which only requires an ID for Penn students—security guards and personnel shut the gates on us. Those who tried to enter were physically restrained and sent in circles to other, unavailable entrances. As one student heard an officer say, the point was to wait us out until the end of the game. According to the university’s ongoing investigation, which began the day of the march, the FBI has been looking into the incident, and one of the perpetrators from Oklahoma, a student at Tulsa Community College, has been suspended. Meanwhile, the core issue remains: a system that encourages and normalizes racist behaviors, however covert they might be. While Penn is considered a liberal campus, racism is prevalent, from microaggressions to faculty dismissing our well-being post-election to white frats turning black students away from their parties. In fact, one of the perpetrators of the GroupMe incident had been accepted to Penn—which is how they gained access to students’ contact information online—and might as well have been any other student on campus. In the spring, following this fall’s Ferguson Friday demonstrations, we’re considering a week of action to disrupt normalized racism and show our peers that we’re here to support them. On November 9, the hallways at the Duke Ellington School of the Arts, a majority-black high school in Washington, DC, were filled with anger, fear, and distress. Then, we got organized. The next day, Youth Blackout DC was born. The day after that, Wilson High School Students announced a DC-wide student walkout, #DCPSwalkout flooded Twitter and Snapchat, and the city woke up. At noon on November 15, thousands of us piled into the Metro en route to the Trump International Hotel in the Capitol District, chanting, “We have a voice!” Our chant sang through the underground Metro cavern, a gloriously empowering ode to our diversity and power. One thing we all had in common: We didn’t get to vote against Donald Trump, and we will resist his administration-elect’s promises of hatred and intolerance. “Hey hey, ho ho, Donald Trump has got to go!” we chanted outside the massive hotel, which used to be one of our city’s celebrated landmarks, the Old Post Office Building. We cheered as an unknown student climbed to a window and waved the rainbow flag. Then we continued marching. As we moved toward the grand marble steps of the Supreme Court, in huge numbers, stretched down Pennsylvania Avenue, the fear of the election melted away. The tools are in our hands: We know, from our history and social-studies and literature classes, the value of peaceful protest and civil disobedience. We know, from ourselves, our families, and our peers, the value of the Movement for Black Lives. We know, from social media, that we can find information, history, legal defense, mentors, and role models very quickly. At Duke Ellington, we have theater, dance, literature, visual arts, and song to say no to oppression—and yes to a future of love, inclusion, and justice. Next up, we’re distributing our Snapchat toolkit, participating in regular, citywide trainings, and joining forces with organizers from other schools. We plan to keep the Trump Hotel as a rallying point. Meanwhile, through our Momentum video project, black youth will be rewriting our own narratives—counterstories to the dominant narratives of violence that have been hurled at us. We had no voice in this election. But we have a voice on the streets. And you will hear it. Students Organizing for Unity and LiberationStudents Organizing for Unity and Liberation aims to create a more conscious and active community at the University of Pennsylvania and in Philadelphia. Grace Dolan-SandrinoGrace Dolan-Sandrino is a Transgender Teen activist, theatre artist, and a co-founder of Youth Blackout DC. Zahri JacksonZahri Jackson is an 11th grade student at Duke Ellington School of the Arts in Washington, DC.